To solve the age-old problem of keeping track of inventory inside a bustling DC, men's accessories company Randa implemented a distinctly modern solution: RFID. How do you keep track of the literally tens of millions of items—belts, neckties, wallets, and the like—flowing through your distribution facilities each year? That was the question faced by Randa Logistics, the fulfillment arm of Illinois-based Randa Accessories, which describes itself as the world's largest men's accessories company. The company's fulfillment center in Reno, Nev., is a case in point. During peak periods, the facility often ran short on storage space, forcing forklift drivers to find any available spot on the warehouse floor to store pallets until they could be loaded onto trucks. Trouble was, dropping a pallet outside a defined storage location made it tough to track—a problem that was only magnified when pallets for a specific order were stored in separate locations. On top of that, pallets were sometimes misplaced, resulting in hours of wasted manpower searching for missing pallets in the cavernous, 525,000-square-foot facility. To help it gain the real-time visibility it needed, the company approached MSM Solutions, a global provider of radio-frequency identification (RFID) and bar-code solutions, back in 2016. For Randa, turning to MSM was a natural choice. The two had worked together before, collaborating on a successful RFID item-level compliance tagging project in 2012. 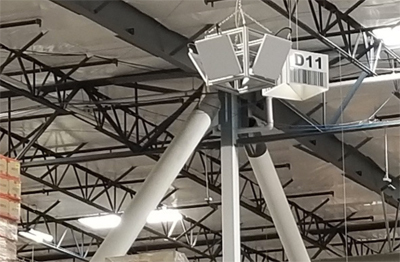 Zebra FX500 readers with four connected antennas were mounted in pairs to support beams, facing toward the respective shipping lanes, to capture the pallet locations. In its initial meetings with the supplier, Randa explained that it was now looking to expand its use of RFID to include identifying, tracking, counting, and managing pallet-level shipments headed to retail stores throughout the U.S. In operational terms, what it wanted was a system that would tell it, in real time, where a pallet was staged, so that once a truck arrived to collect a shipment, the orders could be picked quickly and loaded into the trailer. After conducting a site visit and reviewing Randa's warehouse processes, MSM came up with a solution that would easily integrate into its client's existing business practices. The key components of that system are unique RFID-based pallet identification labels (which Randa is able to generate on demand) and a customized version of MSM's PortalTrack inventory tracking software. With the new system in place, Randa Logistics now has real-time visibility into the current location of any pallet in the fulfillment center. Warehouse associates can log in to any Web-enabled device and see all available pallets for shipping by customer purchase order or retailer ID, with the added functionality to search and sort by other variable data. MSM Solutions also provided a mapping feature that is an exact replica of the sprawling Randa fulfillment center and which will pinpoint any pallet within a zone or show all available pallets within a selected zone. The end result has been both time and money savings for Randa, along with a boost in operating efficiency. "The real-time visibility and reporting that PortalTrack delivered has allowed us to make better and more timely decisions," said Randy Kennedy, chief logistics officer at Randa Logistics, in a statement. "Knowing exact counts and the exact locations of items in a facility this size has eliminated wasted labor costs searching for items, prevented shipment delays, and helped us avoid chargebacks." Feedback: What did you think of this article? We'd like to hear from you. DC VELOCITY is committed to accuracy and clarity in the delivery of important and useful logistics and supply chain news and information. If you find anything in DC VELOCITY you feel is inaccurate or warrants further explanation, please ?Subject=Feedback - : Getting by with a little help from RFID">contact Chief Editor David Maloney. All comments are eligible for publication in the letters section of DC VELOCITY magazine. Please include you name and the name of the company or organization your work for.